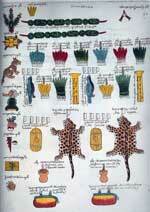 Yes, the Maya and the Aztecs used the feathers of many different kinds of birds in their art. In addition to the quetzal, especially precious feathers came from brightly-colored tropical birds such as the lovely cotinga, macaw, parrot, hummingbird, oropendula, emerald toucanet, and troupial. However, more common feathers of domesticated birds such as ducks and turkeys were also used. Feathers were incorporated into all sorts of clothing and accessories, including headdresses, capes, loincloths, armbands, backracks, shields (pic 1), banners, and fans. Kings frequently wore magnificent feathers, as did images of the gods, and they were also an important part of elite clothing for dance and for war. 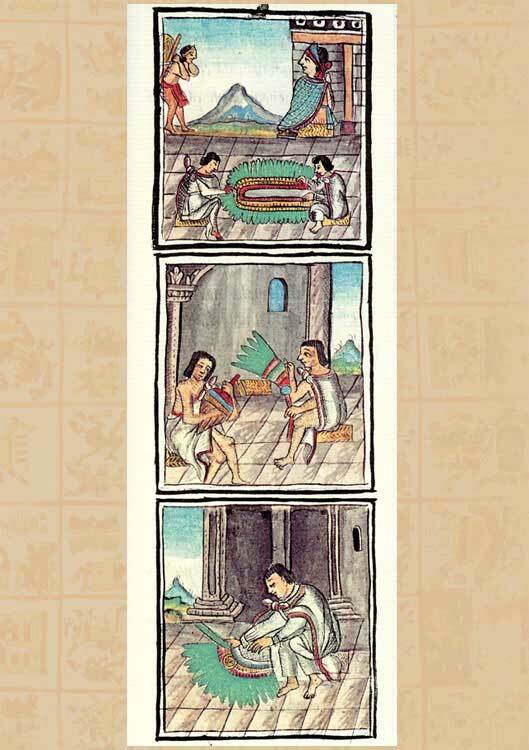 Vivid color was a large part of what made feathers precious to Mesoamerican people. Feathers owe their intense hues to two different processes: pigmentation and structural coloration. The pigment melanin produces brown and black colors, while carotenoid pigments produce yellows, oranges, and reds. The cellular structure of the feather also may refract light in particular ways, often yielding white or blue color. The two kinds of coloration may occur together: for example, green feathers often result from the combination of blue structural coloration and yellow pigmentation. Structural coloration can also yield a special phenomenon called iridescence, where a feather appears to be a different color when seen at different angles. In Mesoamerica, quetzal feathers are notable for this property, appearing blue from some angles and green from others, often with a shimmering golden overlay. Hummingbirds and ocellated turkeys also have iridescent feathers. Although it was far less desirable, feathers could also be dyed to achieve particular colors. 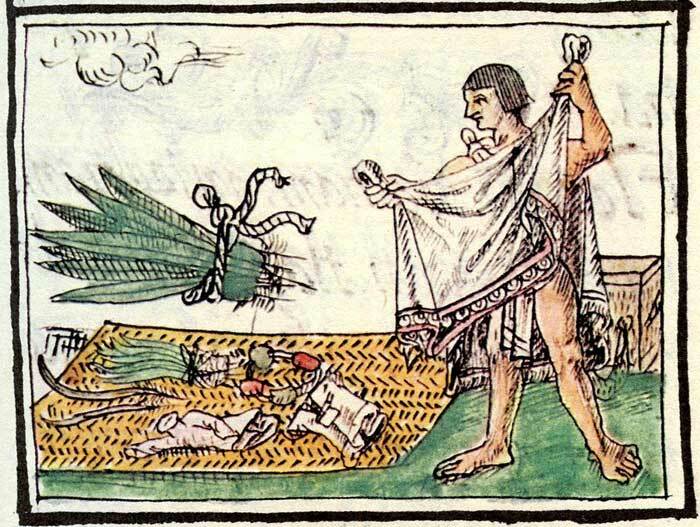 The Florentine Codex cautions against the bad feather worker, who is “a [fraudulent] embellisher of feathers, a treater of feathers with glue. He sells old, worn feathers, damaged feathers. He dyes feathers, he dyes those which are faded, dirty, yellow, darkened, smoked” (Book 10, Chapter 16; see pic 2). 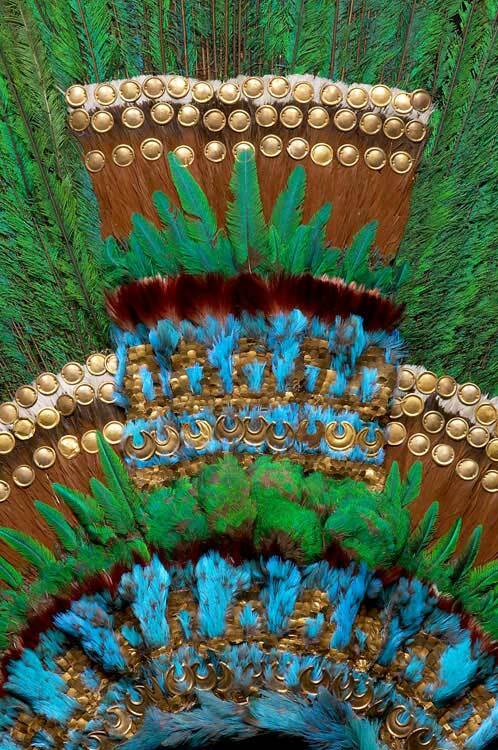 We can see how different kinds of feathers were combined to great visual effect by Aztec featherworkers, known as amanteca, in the famous “penacho de Moctezuma” (pic 3). 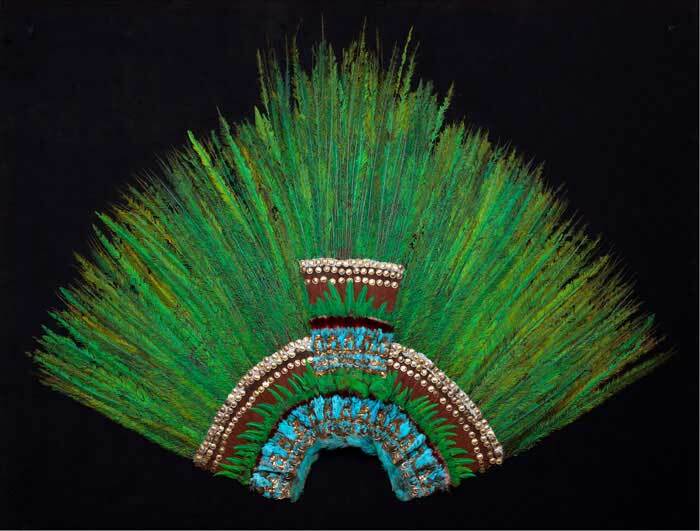 This feather headdress was probably not a gift from the emperor Moteuczoma to the conquistador Hernán Cortés, as legend has it, but it is still a marvelous example of Aztec featherwork. 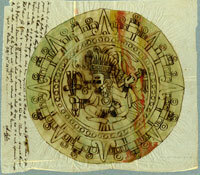 It is now in the collection of the Welt Museum in Vienna, and a replica is on display in the Museo Nacional de Antropología in Mexico City. Over 450 untrimmed tail plumes from the resplendent quetzal (Pharomachrus mocinno) make up the greater part of the headdress. This is a stunning display of extravagance, since each male quetzal bird has only two of these long, flexible tail feathers (called coverts), and these elusive and solitary birds live in mountain cloud forests far from the Aztec capital. Smaller feathers from quetzal wings echo the color below (pic 4). The bright blue feathers come from the lovely cotinga (Cotinga amabilis), while the dark red plumes of the roseate spoonbill (Platalea ajaja) are barely visible above the blue. Brown feathers from the squirrel cuckoo (Piaya cayana) form a backdrop for these brilliantly-colored feathers and gold appliqués, while other brown feathers used primarily on the reverse of the headdress come from a fifth species, which has not yet been identified. This headdress combines the two principal modes of Aztec featherwork: untrimmed feathers are bound into a net-like frame, allowing each feather to move independently, while other feathers are cut and glued into place on a cloth backing. The person who wore this headdress would have been converted into a dazzling spectacle, surrounded by brilliant and shimmering color which changed subtly with each breath or movement. All of these feathers came from lands distant from the Aztec capital. The roseate spoonbill is a coastal wading bird, while the squirrel cuckoo inhabits a broader range along the hot coastal lowlands. The lovely cotinga’s territory lies to the south and east in the modern states of Veracuz, Oaxaca, and Chiapas in Mexico, extending south into Guatemala and Central America, while the quetzal is confined to the cloud forests of Chiapas, Guatemala, and Honduras. All of these feathers - and many others - came to the Aztec capital of Tenochtitlan as trade or tribute (pix 5 and 6). 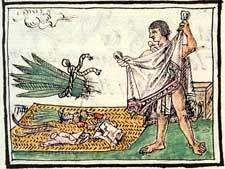 Indeed, the history of Aztec featherworking is also a story of imperial expansion. Book 9 of the Florentine Codex explains that the first Aztec featherworkers used “common” feathers of local herons, ducks, and turkeys to make their feather ornaments; new kinds of tropical feathers were added as Aztec territories grew during the reigns of Ahuitzotl (r. 1486-1502) and Moteuczoma II (r. 1502-1520). But trade in feathers between the tropical south and the Central Mexican highlands also existed long before the Aztec empire. 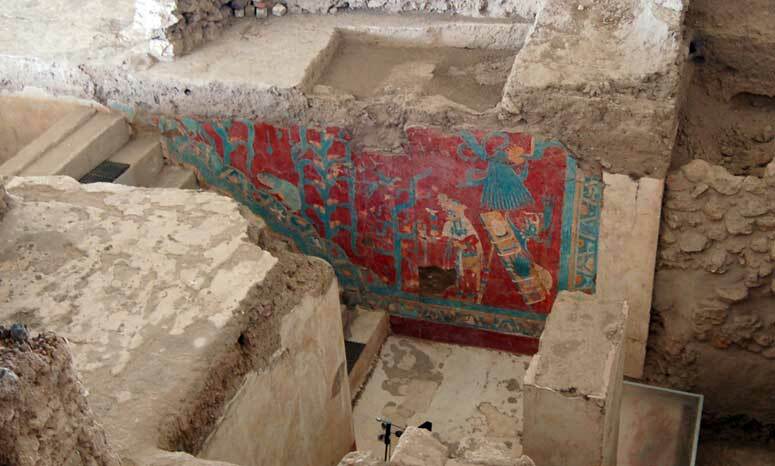 Feathers are among the precious goods on the old merchant god’s backpack in the murals of the Red Temple at Cacaxtla, Tlaxcala, ca. 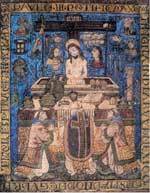 AD 800 (pic 7). The old god stands at the bottom of a stairwell whose walls are painted with maize plants sprouting human heads; climbing the stair simultaneously replicated the merchant’s journey from the hot lowlands to the Central Mexican highlands and the ascent from the underworld where cacao and maize grew in captivity before the creation of the present era. 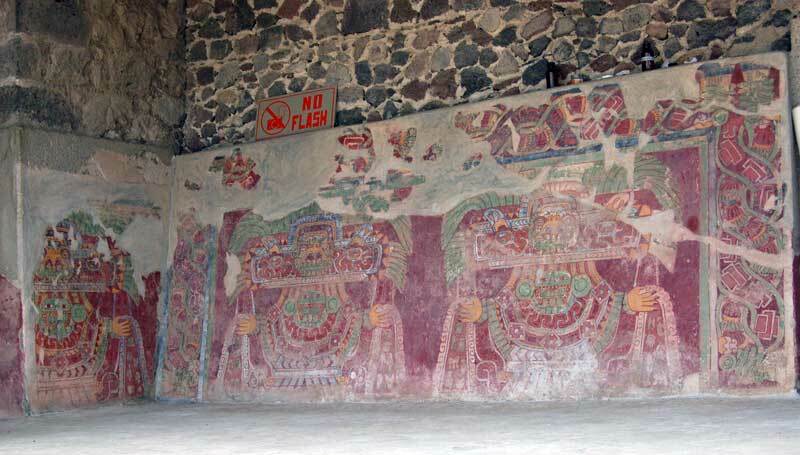 Traveling back even further in time, the murals of the powerful city of Teotihuacan, AD 100-600, show priests and deities wearing elaborate feather headdresses, again testifying to trade with the tropical lowlands (pic 8). For the ancient Maya, we have neither physical evidence of surviving featherwork nor textual evidence describing featherworking practices. But elaborate feather headdresses, costumes, and accessories are represented in many stone sculptures, and also in mural paintings, like those of Structure 1 at Bonampak, ca. AD 792. Entering Room 1 at Bonampak, one sees royal youths with elaborate feathered backracks performing what is specifically named as a “quetzal dance” (pic 9; the decipherment is by Stephen Houston). Above on the opposite wall, the princes prepare for the dance, donning their heavy backracks with the aid of attendants (pic 10). It is easiest to identify long quetzal feathers, but red feathers and brilliant yellow feathers (perhaps from the oropendula, Psarocolius Montezuma) also appear in the paintings. 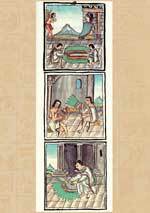 Yet even in the Maya area, feathers were an expensive luxury, and throughout the murals, many nobles wear only a single quetzal feather. Throughout Mesoamerica, feathers were dazzling wealth indeed. They were prized for their splendid color as well as the difficulty of their acquisition. Their fragility and the need for periodic renewal only increased their value. After the Spanish conquest, featherworkers transformed their arts to represent new subjects, making “feather paintings” Christian devotional images (pic 11). • Wolf, Gerhard, Alessandra Russo, and Diana Fane, eds. Images Take Flight: Feather Art in Mexico and Europe. Munich: Hirmer Publishers, 2015. 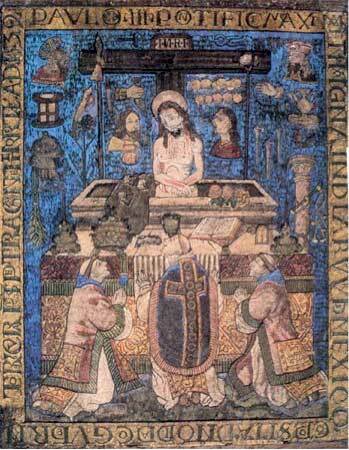 • Pic 11: The ‘Mass of St. Gregory’, feathers on wood panel, 68 x 56 cm, México, 1539. Musée de Jacobins, Auch. Possibly by Diego Huanitzin. From Wikimedia Commons (Diego de Alvarado Huanitzin).